By now we’re all familiar with the Padres occasionally breaking out the camouflage uniforms. No matter what you think of them (I know plenty of you feel pretty passionately on both sides), one critique applies: If they really had the courage of their convictions, they’d wear camouflage pants to go along with the jerseys. That may sound like a crazy idea, but it turns out that there’s a full-camo team out there: the U.S. Military All-Stars, a group of servicemen who travel the country playing exhibition games against college and amateur teams (a program known as the “Red, White and Blue Tour of America”). I learned about them when reader Jeff Israel pointed me toward this video clip, which shows the military team dressed in solid camo while playing against a team of all-stars from the Cape Cod League (one of those summer leagues for college players). 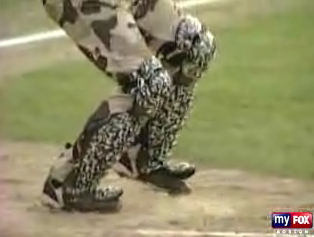 In addition to the camo pants, the catcher even had camo shinguards (or is that more of mosquito net pattern, rather than camo?). I was curious, so I started poking around and discovered that the camouflage trousers appear to be new for this year — pics from previous years show the team dressed in conventional pants. I also learned some other uni-related tidbits: The yellow S on the jerseys, for example, symbolizes support for the troops, like a yellow ribbon. 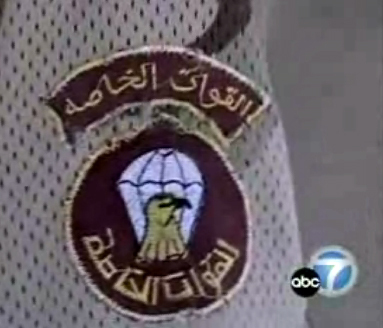 And I could probably devote an entire column to the team’s sleeve patches, which range from the predictable (like a basic service designation) to the bizarre (one guy said he cut this patch off of the uniform of an Iraqi Special Forces soldier, which seems like a questionable move). Uni Watch News Ticker: Disturbing article here and marketing/sponsorships in high school sports. ”¦ Sam Piper found this very amusing page that shows a Thai observer’s take on MLB uniforms. “Just goes to show the international nature of Uni Watch,” says Sam, who hails from Australia himself. ”¦ Central Florida will unveil their new football helmet this Thursday. ”¦ The Yomiuri Giants have added a sleeve patch to commemorate the franchise’s 5000th victory, which took place last month. You can just barely see it here (with thanks to, of course, Jeremy Brahm). ”¦ Does anyone know why Eric Butorac and Jamie Murray were wearing history’s most embarrassing tennis shirts during their Artois Championships doubles match yesterday? ”¦ Shawn Green came off the DL yesterday, and so did his superscript Y, which has now gone unfixed for over two months. ”¦ Casey B. notes that you can barely read the uni numbers on the Honduras soccer team jerseys. … Every wonder what happened to those newfangled synthetic basketballs that the NBA briefly used and then discarded? Okay, so you probably haven’t wondered, but here‘s the answer anyway (with thanks to Chris Flinn). Love the story on the synthetic basketballs. Perfect use for them, but is anyone else thinking the kids who receive these basketball monstrosities should treat them like “muffin-stumps” at the homeless shelter? …so if the army’s baseball team wears camo, does the navy’s team wear white bell bottoms with donald duck caps? Dave Wiggins, used to work in Japan and covered sumo for NHK. And the camo thing isn’t just for uniforms, either. I took this picture of Daisuke Matsuzaka (aka Dice K) wearing a camo glove during BP last week. Fortunately, he was back to his regular old red glove when he pitched a couple days later. Anyone know if the Padres have any plans on switching their camo style jerseysto the updated camo style that the Army wears now? It looks like his name is on his necklace too…. He also wears a camo undershirt almost every time he pitches. Not uni-related, but, headline of the day? Wow, you’re right. I hadn’t noticed that. I blew up a picture of it here, seems to say MATSUZAKA JB or maybe IB? Oh, jeez…How did I not get that? I wonder if Okajima has his name on his necklace too? Yikes! Whether those are camo, mosquito net, or fishnet shinguards, the picture of the cathcer made me think of the country & western gay disco down the street from me. Please, no one get worked up over this, the unis just remind me of weekend gay bar attire. That’s neither a inherantly good or inherantly bad thing. I think it’s great that the NBA donated basketballs to a CHRISTIAN organization. In this day to political correctness I’m really suprised about this. I thought they’d give to whoever, but never CHRISTIAN. I am happy to be wrong. Kudos to the NBA. i would love to see some uni watch prototype hats using the twins enterprises “franchise” hat type. I don’t think so… the main reason the synthetics were dumped was that they were causing cuts on the players’ hands, due to the fact that NBA players spend several hours with basketballs in their hands every day during their 82-game season! High school, college, and recreational players have been using synthetic-covered basketballs for years without any problems. The casual homophobia of the Bangkok Post article is pretty offputting. I love those cammo unis! To go along with their color scheme, the Pads should have the jersey updated to digital cammo and the color should be navy, sand, and white. Oh, and on a different topic, does anyone have any information on the old Tampa Smokers baseball team? I saw a replica jersey at Distant Replays, and I was wanting to know more about them. As a cigar smoker, the jersey would be a cool thing to have. Was anyone else thoroughly amused by the Thai article on baseball uniforms? I sure was, especially the description of the Rockies…. That sounds like trademark dilution! Cape Cod League (one of those summer leagues for college players). Just an FYI, the Cape Cod League is widely regarded as THE summer baseball league for College Players. Take a look at their website for their list of alums in the Majors. It’s pretty remarkable. One of the major draws for college kids (other than living on the Cape for a summer) is the fact that they use wood bats, instead of aluminum. Speaking of wood bat summer leagues, the Texas Collegiate League has been up and running for a few years. The Coppell Copperheads have a fun logo, featuring a snake swinging a bat. this snake would only be able to have 1 grip on the bat, and according to the copperhead logo, it hits with a backhand. Speaking of Daisuke Matsuzaka’s necklace, I’ve been trying to figure out who makes them, where they’re sold, etc., but the Googletron is failing me. Or maybe it’s my search skills. Anyone have a pointer? Reminds me of Hiss from the Disney version of Robin Hood. [quote comment=”101246″]Cape Cod League (one of those summer leagues for college players). Amen! It’s pretty startling. Something like 1 in 6 big leaguers spent time on the Cape and one in 2 big leaguers who went to 4 years colleges passed through. For example, Ted Lincecum was pitching for Harwich just two summers ago. Mark Texiera and Chris Young (P) are also notable recent alums. They say Thurman Munson was the first big name to develop on the Cape. The season starts this weekend (minus CWS players…) and I can’t wait. It’ll be worth the drive up from CT to see many future pros. If I am not mistaken… his necklace is this. or of course you can get them right from the Phiten website I linked to. 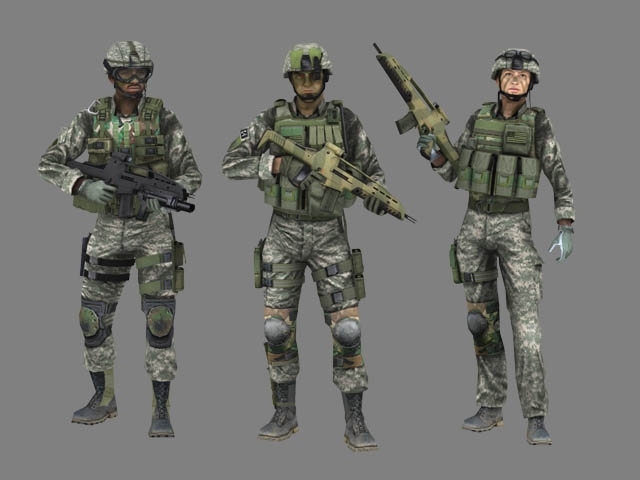 I can’t find any photos, but I know I saw an ad for Under Armour Camo gear for the fall of 2007, and they are now going to the digital style camo for all of their hunting gear. I tried looking on the UA site but they don’t have a section for upcoming apparel. At 1st I felt silly for even noticing such details, but then I remembered why weÃ¢â‚¬â„¢re all here. Which looks better, the Yanks and Cubs full shoulder yoke, or the Astros, Rox, and Mets pinstripes that terminate at the shoulder seam? The full yoke makes tubby players jerseys ill-fitting, but looks okay otherwise. The Terminating pinstripes fit better on a wider variety of players. When I initially thought about this I anticipated preferring the CubsÃ¢â‚¬â„¢ style, but after looking at many photos I believe this is one of the few things the Rox have gotten right. Can anyone track down pictures of the Twins road jerseys from 1991 or 1992? I have one that I’m thinking of getting customized and I want to see how the backs looked…e.g. – did they have nameplates? I can’t find pics anywhere. Is the comments board not working? The minor league bowie baysox are apparently going to wear camo uniforms for “ARMY NIGHT” in a couple days. They are also going to have Sgt Slaughter on hand for some wackiness. Twins road jersey 1991: pinstriped with non-pinstriped nameplate, as seen in this shot from the 1991 World Series. Posted this before but seemed more appropriate with today’s topic. At an NHL allumni game. Former Ranger goalie Scott Dickie with some camo equipment on. here you go Johnny H.
moose84 – that’s the home uni’s, but nice try anyway! Went into the Rockies store yesterday to buy a cap. I wanted a real one in case they stop making them. I asked the manager if the new synthetic ones ever get broken in so they fit properly. Instead of answering he just tried to push the bp cap on me. He told me they were flying off the shelf, because they’re so comfortable w/ the stretchy sides. I told him i didn’t care how comfy they are, they’re too ugly to wear. I also said i was surprised they sold well b/c half the MLB has given up wearing them. He didn’t respond to that either. I am trying to find the Under Armour stuff that will be coming out later this year that has adopted the digital camo look. I wasn’t clear enough. I meant do the polyester game caps break in? Not the bp ones. Acquiring patches from odd places is not uncommon in the military. I have quite a few, um…artifacts, from Desert Storm,Somalia and a few other places. The trick is getting them through customs. Another Cool logo from the Coastal Plain League, The Thomasville Hi-Toms. As far as I know, only a couple leagues use the wood because of the significant expense. The Cape, Alaska and Coastal Plains do. I’m not sure about others. Just saw this on the Rangers homepage, a Q & A with the team equipment manager. QUESTION: How long does it take to put together an actual jersey for a player once he’s acquired in a trade and you know what number he’ll be wearing? MARQUES: I could probably have one in an hour. That happened with Dupuis. We were leaving for Washington, and before I left I made sure that we had the jersey in time. We carry blank jerseys, so if something does happen on the road and I can’t overnight a jersey, I’ll make up the jersey while we’re on the road. We’ll carry numbers, and the letters we’ll trace out by hand and just stitch. We’ll put it together ourselves. It doesn’t look as nice, but you can’t tell on TV. [quote comment=”101327″]Just saw this on the Rangers homepage, a Q & A with the team equipment manager. I’m sure 99% of us can tell on TV!!! I wonder if they will have to change this method now that everyone has HDTV. I think it would be much easier to tell. [quote comment=”101328″][quote comment=”101327″]Just saw this on the Rangers homepage, a Q & A with the team equipment manager. Paul Lukas can definitely tell. Good description of the Astros’ uniforms being created by a spaghetti fight, though. Aren’t Hootie and the Blowfish from South Carolina? This was discussed a few weeks ago and yes there’s a connection. Last night during the Dodgers telecast, Vin Scully noted that Wilson Betimit was wearing his pants cuffed at his knees. He said it was better on two points. First that is where they are supposed to be worn and also it helps the umpire call balls and strikes. From yesterday’s Ticker….the Texas High School baseball Harlingen South jerseys were horrible. I saw then first hand. That being said… I couldn’t help but notice this yellow visor on the catcher from the New Deal Lions, Class 1A runner up. 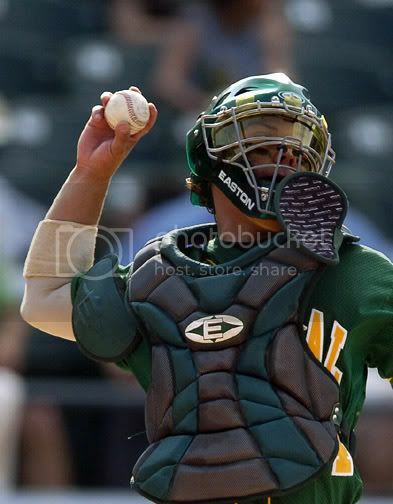 I don’t think I’ve ever seen a catcher wear a visor, much less an amber one. maybe america is actually working today…go figure. very slow sports day…this past weekend I went to the LPGA Championships at Bulle Rock. Met Annika, Paula Creamer and Lorena Ochoa. Cameras weren’t allowed in or I would have some sweet pics. Love how Paula always coordinates her gear. I noticed that she has “Paula” stitched into the sides of here spikes. There were a few other golfers there wearing the same ones, but she was the only one with a personalized pair. Yes it has been a slow day. Yesterday too for that matter. I’ve been watching the College World Series (or more correctly, the regionals and super regionals) and I noticed that at least one Mississippi State player had some sort of shiny, possible hologram type sticker on the back of his batting helmet. No pictures as Mississippi State’s athletics site is surprisingly bereft of pictures. It’s probably a manufacturer logo or something like that, but I felt it was worth mentioning if for no other reason that one seems to have much to say today. [quote comment=”101393″]very slow sports day…this past weekend I went to the LPGA Championships at Bulle Rock. Met Annika, Paula Creamer and Lorena Ochoa. Cameras weren’t allowed in or I would have some sweet pics. Love how Paula always coordinates her gear. hot young lpga golfer is also on “the list”, as well as yesterdays womens beach volleyball player. FYI… new SI cover features Omar Minaya, El Duque, John Maine, Endy Chavez, and Willie Randolph…. wearing the snow whites, although they are wearing them with the blue hat, so its a start.. The Cape Cod League is still considered the premium place for talent to be placed in the summer, however the Northwoods League is starting to nip at its heels. I’m going to be very honest, I am a biased source seeing as how I work for a NWL team, but I will point out some of the differences between the two leagues for anyone who cares, and try to possibly get some uniform pictures in since this is why we’re all here. I will try to keep editorializing this to a minimum and present facts. I am in no way trying to cut down the Cape but just inform people a bit more about summer collegiate baseball. The Cape Cod League (the league portrayed in the Freddie Prinze Jr epic “Summer Catch”) was at one point subsidized by Major League Baseball which is why you see teams with names like the Braves, Mets, Cardinals etc. It plays a 44 game schedule over 62 days on basically high school fields with little to no support facilities (i.e. concession stands, clubhouses etc). Most of the towns in the CCL are in close proximity to each other so there is no real feeling of a “road trip.” And finally, players in the CCL are given jobs to do over the summer while playing baseball. For a long time the CCL was the clear cut #1 league with all the other summer collegiate leagues considered vastly inferior. Lately, that has changed. Within the last two to three years the Northwoods league has taken charge of all the others and is now considered the clear-cut #2 league in the country. The NWL plays a 68 game schedule in 75 days (more accurately portrays a minor league schedule). Players in the NWL concentrate solely on baseball for the summer (no summer jobs) and with the league spread over 4 states and into Canada go on some pretty hefty road trips. The Madison Mallards routinely play in front of over 5,000 fans and have an amazing atmosphere in an old baseball town, and the Duluth Huskies have one of the coolest/most historic stadiums around, complete with clubhouses, a clubhouse attendant, beer garden, concession stands and a great mascot. It also has seen players like Hank Aaron, Roger Maris, Willie Stargell, and Denny McLain play there in the old Northern League Days as well as Darryl Strawberry, Jack Morris, JD Drew and Kevin Millar more recently. My point is although the Cape may get a lot of recognition the NWL is a hidden gem to a lot of places. P.P.S. Someday I will post great uniform pictures from around the league but not today. As far as I know, only a couple leagues use the wood because of the significant expense. The Cape, Alaska and Coastal Plains do. IÃ¢â‚¬â„¢m not sure about others. The Northwoods League (Wisconsin, Minnesota, Michigan, Ontario) also uses wooden bats. amazing! some game-worn owners might not appreciate this kind of leak, or is it the hand crafting that makes them more valuables…Also the number of jerseys is ridiculous, 12 for 80+ games, especially the whites if you consider the roughness of this game. How much is a hockey jersey? The Alexandria Beetles of the NWL play in Knute Nelson Memorial Park, next to a lake. It doesn’t get much more Minnesotan than that. It’s too bad about the purple pinstripes…. [quote comment=”101203″]Not uni-related, but, headline of the day? I liked this one better. [quote comment=”101424″][quote comment=”101203″]Not uni-related, but, headline of the day? Elementary art class lesson of the day: red + blue = ??? [quote comment=”101430″][quote comment=”101424″][quote comment=”101203″]Not uni-related, but, headline of the day? Looks like Peyton Manning isn’t sure what to do with jerseys that have buttons. The spam filter must really hate my links, or something. It almost never works. NFL article: Reebok allowed Mike Nolan to don a suit for two games last season but so far is resisting his request to go formal full time. Fans are going to protest by wearing suits to the first home game on Sept 10th. Being that today’s been deemed a slow day, I flipped on Setanta Sports and began watching Hurling. I have absolutely no previous knowledge of this sport, however I did notice right off the bat that some players were wearing helmets and some weren’t. Even better is that there is no uniformity to the color of the helmets. I snapped these pics from my television with my camera phone so they are blurred but you can make out the colored helmets. Seems like it would be difficult to make out the opposing team if they have the same color helmet on. I think in this case “red + blue” will equal “a bunch of blue shirts in the trash.” We’ll see. Those are Milwaukee Mustangs uniforms! Some vague rumours about the Islanders new jerseys. Doesn’t sound good. – Players stay with host families and are offered the opportunity to be matched up with flexible employers to help earn cash over the summer (you’ll see players at CVS, Stop & Shop, painting fences, running youth clinics, etc.). Most players work because it’s nice to pick up a few bucks over the summer. – The longest road “trip” is Wareham to Orleans which is probably about 80 minutes. Most games are within a half an hour of most teams. Sure there are no “road trips” but I’m not sure that’s a bad thing. Who wants to live the minor league life until you have to. Playing clsoe to home gives players more time to make money, go to the beach, play golf, and otherwise enjoy the Cape. – The fields are all used by high schools and the quality varies but I’d wager to say all but a couple are way above average for HS in the northeast. Eldgrege Park is downright gorgeous. – I liked the fact that I could go see all 44 games of my favorite team because the parks were all so close. The small(er) crowds made the players (and parents like Tony Gwynn or media celebrities like Falmouth Commodore fan Peter Gammons) much more approachable. Not sure if this has been said on here before, buuuuut. What is Fausto Carmonas underbill tonight vs the marlins? After Verlander threw his no-hitter, he got the cream-pie in the face, courtesy of Todd Jones in an Oakland Raiders cut-off tee. anyone see this soccer jersey related video? I know the Great Lakes Leauge, In Ohio and other places in that area use wooden bats. My Home town team, the Lima Locos (after the trains) have ugly Unis, but they are wood bats. The one out here, I think it’s Horizen something…. has the Yuba Sutter Gold Sox in it, and we use wooden bats here too. I thought they all did. [quote comment=”101414″]As far as I know, only a couple leagues use the wood because of the significant expense. The Cape, Alaska and Coastal Plains do. IÃ¢â‚¬â„¢m not sure about others. 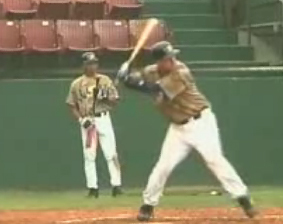 The Valley League (Virginia) also uses wooden bats.